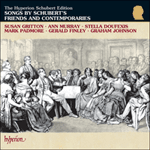 Schubert set this text three times; two of these are recorded in The Hyperion Schubert Edition, but the third (D714, for male-voiced octet accompanied by low strings) falls outside the scope of a series devoted to the vocal music with piano. Loewe’s version for vocal quartet and piano, his Op 88, was composed in 1840 and published two years later. 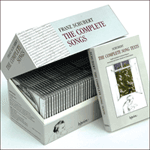 It is the composer’s considerable achievement to have written accessible music, not terribly difficult to perform, that nevertheless does not seem unworthy of great words that gave even Schubert considerable difficulty. Loewe’s part-writing for the voices is skilful, the pianistic interludes are water music of some originality and effectiveness, and the three vocal solos (for soprano, bass and finally tenor) are cleverly set to reflect the words and different terrain through which the water passes. The quartet reassembles for the charming allegretto coda (‘Wind ist der Welle / Lieblicher Buhler’) where the composer’s lilting invention is, once again, charming without being untrue to the profound spirit of the text. If this is Hausmusik, it is of a very superior kind, and entirely typical of Loewe’s often astounding professionalism. delight in their own countenance. how like the water you are!